There are times in this life when you get put in the middle of a situation, and all you can do or say is…… the Right Thing. This is one of those times for me, since I have been writing about the tragic occurrence that transpired in a South Florida high school two weeks ago……!! What I am about to reveal is a story of Two Friends of mine…… one who lost his life in the horrific shooting on February 14 at Stoneman Douglas High, and the other who is trying to keep his job, because of “terrible failures” under his charge, both prior to, and during the shooting. The first friend, Aaron Feis, was the Douglas assistant football coach and security guard, who after hearing gunshots, ran towards the shooting scene, with No Weapon and wearing No Bulletproof Vest for protection, to render assistance to anyone who was in Harm’s Way. Aaron ended up shielding several students, saving their lives, but in the process, was mortally wounded, costing him his own life. AARON WAS A FRIEND WHO WAS ALWAYS THERE FOR ME, BUT SADLY HE WILL NEVER BE THERE AGAIN!! Aaron and I talked all the time, about myriad things, and as I have said before, he was there for me when I had children at Douglas High, keeping me abreast of everything they did, both “good and bad.” He was the kind of person who would give you the “shirt off his back” if you needed one. And, to prove my point, he Gave His Life for several students on February 14. He had one child, a daughter, who is 8, and whom he “doted” over, like there was not another child in the entire world. He “watched” over my children, when they were at Douglas, the very same way. YOU DO NOT GET MANY FRIENDS LIKE AARON FEIS!! 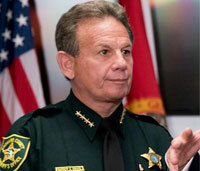 My second friend, Scott Israel, is the Sheriff of Broward County, Florida, and I have known him for many, many years. Before entering Douglas, my son played football, and my daughter was a cheerleader with the Coral Springs Chargers youth football program. Scott’s triplets (two sons and a daughter) were younger than my children, and they followed my two into the Chargers. My son, every Fall before going back to college in Colorado to continue his football career at the next level, would volunteer as a coach with the Chargers, and he worked with Scott’s two sons, before they went on to Douglas, where they also played. My daughter, while a Douglas cheerleader, was also a cheer coach with the Chargers, and she helped coach Scott’s daughter, before his daughter went on to Douglas. Scott is another person who was always there, if I needed…… ANYTHING. He followed his father into law enforcement, and when his father passed away, Scott was devastated, because of the closeness of their relationship. So, periodically during the day I would call him just to say that he will always have great memories of his dad, and just how proud his father was of him, to try and bolster his spirits. Scott would ask for advice, but he was also quick to “tell you off”, if he disagreed with you. HE IS ALWAYS HONEST, AND LIKE AARON FEIS, YOU DO NOT GET MANY FRIENDS LIKE SCOTT ISRAEL. Now, I get to the point I raised in my first sentence of this message…… there are times in this life when you get put into the middle of a situation, and all you can do, or say, is The Right Thing, and with Aaron and Scott, especially with Scott, this is one of those times!! Aaron Feis ran into a building where there was an “active shooter”, and all he had for cover was His Courage and a Big Heart. Scott Israel’s deputies, four of them, although well-armed, wearing protective body armor, and well trained for this type of engagement, stayed safely outside the building, listening to the gunfire. When Harry Truman was president of the United States, he encountered problems in his administration with the economy, among several other things, and he was dealing with World War II, when he dropped the Atomic Bomb on Japan to basically end the conflict. When he was asked how he dealt with all the terrible situations that he encountered in the White House, he always pointed to a sign on his desk in the Oval Office, which said: THE BUCK STOPS HERE!! With Scott Israel, although we are friends, no matter what he says to counter those who question whether he should stay in the job as Sheriff or not, I say one thing: THE BUCK STOPS WITH HIM, AND AS MY DAD SAID, THOSE DEPUTIES WHO WERE DERELICT IN THEIR DUTIES THAT DAY, WERE REPRESENTING THE SHERIFF. With that being said, given the evidence of what his deputies Did Not Do on that “fateful day”, also given the evidence of his deputies being involved with the shooter, on numerous occasions, before that “fateful day”, and in spite of our friendship, I can only do The Right Thing by saying…… SCOTT ISRAEL, FOR THE HEALING PROCESS TO BEGIN IN THE AFTERMATH OF THE DOUGLAS KILLINGS…… MUST RESIGN AS BROWARD COUNTY SHERIFF! !